Born: 1896, Stoke, Ipswich, Suffolk. Died: 9th March 1918; age 21; KiA – Palestine. 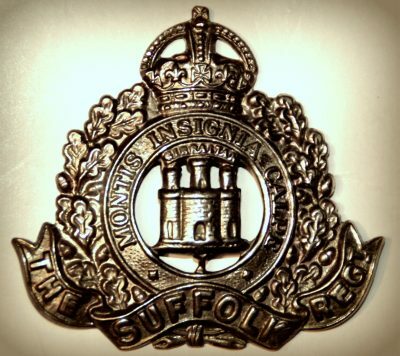 Regiment: Suffolk Regiment, 15th Battalion, (Suffolk Yeomanry). 1901 67, Purplett Street, Ipswich. Charles was 4 years old and living with his parents, siblings & cousin. Thomas Andrew Clover, 39, a Foundry Labourer, born Needham Market, Suffolk. Susannah Clover (nee Gardiner), 43, born Ipswich. Ellen Louisa Clover, 18, a Cardboard Box Printer, born Ipswich. Agnes Maria Clover, 16, a Tailoress, born Ipswich. Sarah Adelaide Clover, 13, born Ipswich. Grace Clover, 12, born Ipswich. George James Clover, 9, born Ipswich. Mary Podd, 14, a Fancy Cardboard Box Maker, born Ipswich. 1911 377, Wherstead Road, Stoke, Ipswich. Charles was 14 years old, a Plough Handle Fitter – Wooden – Plough Works. He was living with his widowed father & siblings. Thomas, 49, a Foundry Labourer – Iron Foundry. Agnes, 26, the Housekeeper – at home. Sarah, 23, an Almond Blancher – Wholesales Grocers. Grace, 22, an Almond Blancher – Wholesales Grocers. George, 19, a Coal Poret – Coal Merchant. Charles’s mother, Susannah Clover, died 1910, Ipswich. Charles is also remembered on the Orwell Works Memorial Ransomes Sims & Jefferies Ipswich.